As a designer and artist, I have always been particularly inspired by whichever specific material I work with on any given project. It all started when I was boy. I used to make things out of card and paper. I played with origami and made models from books in which a flat sheet became a three-dimensional object. Then in high school, as a painting and printmaking student, I broadened my understanding of materials by experimenting with papier mache, wirework, different paints, inks and printing processes. I also first learned how to use clay then, once again opening my creative self to a fuller understanding of matter. In art school, at the University of Cape Town I was confronted with a whole array of new materials as well… oil paint, mould making, bronze casting, welding, forgery, and on and on. This lifetime of play and being forced to try new things has been really useful in helping me to think around different possibilities for my current work. All the work I now engage in is informed by all the work I have made in the past. Every ‘mistake’ I have made in the past was not a mistake at all, but rather a way to understand the making of things better. Through this understanding of creativity, I acknowledge the importance of my work-process as being almost more important than the end product itself in many ways. This work process has gone through a number of different phases, characterised by a number of broad material-usages throughout the past 10 years. These materials and their accompanying lessons are outlined below. During my childhood I played a lot with paper, card and glue. I learned the terminology of origami – the difference between a valley fold and a mountain fold (the only 2 possible options when dealing with a piece of paper or card – it just comes down to where you put each fold). So when I reached my honours year at Michaelis, I had good familiarity with this way of thinking about space – as a series of flat planes. I became fascinated with this structural framework, and almost obsessively made countless experimental models using off-cut card (obtained for free from printers around the city), staples, and masking tape. For a year. The work I made in this year has led to every single thing I have made subsequently, and the coolest thing is that I haven’t used even half of the ‘tricks’ I figured out in that year. Of utmost importance is the process that came to light in the course of making all these models and giving myself the chance to play so freely. I use this work process every time I’m challenged with a new project or problem – I try to play with it. Then I try again. Invariably there are more red herrings than there are good solutions, but by practicing this way of working over time, my speed and agility in this arena has improved. The second VERY important thing to mention here is the importance of limitation. I imposed very strict and simple ‘rules’ on myself – to ONLY use card, staples, and tape. Within this tight framework, I was totally free to explore the very bounds of space and structure. Awesome. 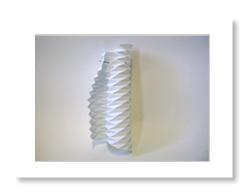 In art school when I experimented with many and various fold systems, I designed and made a piece of paper that was intended to crumple ‘perfectly’. I pre-creased a regular triangular grid onto a piece of card, trying to ensure that it would not crumple ‘normally’ – in a chaotic way – but rather in an ordered, pre-determined and predictable way. This failed horribly, but it was a nice thought. 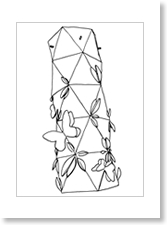 Die cutting is part of the commercial printmaking process. Once a flat piece of card is printed with your breakfast cereal’s name (for example), it is cut using a die. A die is a thin sheet of plywood, with custom shaped blades sticking out of one side. Some of these blades are very sharp, and some are blunt. So, once the die is mounted in a press, and the printed board is fed in; tonnes of pressure slam against the die and the board, making creases where there are blunt blades and cuts where the sharp ones are. The printed card is now easily folded into your favourite cereal packaging. And the packaging for your washing powder, and your Rooibos tea, and your latest internet purchase. 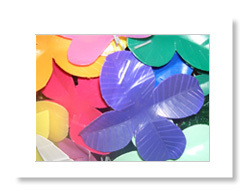 In other words, die-cutting is a cost effective way to cut out LOTS of identical paper, card or thin plastic units. Into any desired shape - including shapes that are difficult to cut by hand. Like clips and slots and tabs. For attaching pieces together. Gluelessly. I used this simple process to produce my earliest lights. I initially made one pleated lampshade for an exhibition called Aisle 5, which was organised by a friend from art school. This light was based on a whole bunch of experiments I had done during my art school days. Post graduation, I had continued to play with paper… moving from using free off cut card, into beautiful coloured art papers. I laminated 2 colours together to create paper with 2 differently coloured sides, and cut and creased lots and lots of things. Some really cute toys and models were thus developed – by trying to find a commercial avenue for the skills I’d established in 1999. I also got my first few jobs with these models – to make interesting invitations and fliers - I was becoming known as the ‘paper guy’ in Cape Town. 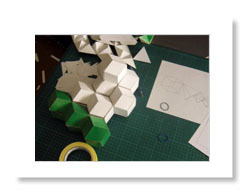 My business card of the time read: paper engineer. After Aisle 5, (at which I sold the light I had exhibited), I saw the huge potential in lampshades as good products, and how all the work I’d done till then could be used for making them. The only transition I needed to make then was from paper to something else – I thought paper was too delicate and too difficult to clean as a lampshade material. So I found and tested samples of different commercially available plastics, eventually stumbling upon polypropylene as the ideal, easily die-cut material. A friend of mine then handily opened a store for artists making products (called Bread and Butter), and I had plenty to offer. I produced a large range of die-cut pleated shades, and others that were all about experimenting with different die-cut clips and joins. I also entered the realm of giftware, making fairy lights, greeting cards, pop-ups and other novelty cardboard goodies. I was working alone at the time, so die-cutting was the perfect production method – I could have lots of units cut and assemble them myself (relatively easily) to sell on. 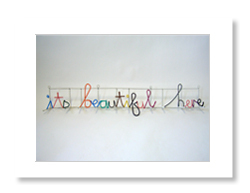 The most typical local craft material in South Africa is galvanised steel wire. When you make anything from wire, there is really only one way (apart from welding) that you can attach part A to part B – binding. hold 4 hand length pieces of thick straight wire firmly in one hand. Now, clamp the end of a very long piece of thin flexible wire under your thumb (still holding the 4 wires firmly in that hand). Run the thin wire to the end of the bunch of thick wires. Using your other hand now, start to wrap all 5 wires tightly with the thinner, softer wire. This anchors your binding (by securing the ‘tail’ end of the binding wire under itself). Continue to bind along the length of the bunch of wires (moving your hand along as you need to). You’ve bound 4 wires together! Now you can bind. This bound section is much stronger than 4 wires individually, because they are bound. ‘Strength in numbers’ is the name I chose to call the objects I design using this principle. I was using my knowledge from earlier folded paper models and designed new things that were all about the wire. These products all rely on the wire itself to give them their form, and they rely even more on the binding. Without being bound (I used colour to bind them together) they would simply be pieces, albeit beautifully hand-formed pieces. The hat-rack we produce that declares any space it’s placed in to be beautiful (it’s beautiful here’) is part of this range, as are a few candelabra and some large screens. Of course, all my recycled plastic shades are based in this thinking too - we make every structural part of the ‘other people’s rubbish’ range by binding carefully hand-bent wires together. In Africa, re-use is very common and often necessary - as seen in much local craft, where waste (by other standards) has always been used as a material. So using plastic post-consumer waste as a raw material was ideal for my purposes in 2004 (i.e. when I was looking for a new voice for myself in the contemporary South African design arena). Not only is it historically relevant as a material, but the time was right to spread the word about recycling to a pretty unaware SA public. In other words, I started using old bottles before it became cool, and not just because it’s green to do so. Once encountered, I fell in love with this extraordinary material. I had developed an appreciation for light in my earlier work, but bottle-plastic opened up so many new areas of exploration - details like the emboss/deboss of many brands’ logos, the date stamp on milk bottles, and the different colours, textures and thicknesses of any given bottle. 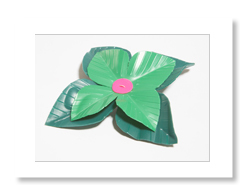 Over time, I also began to encounter all the translucencies available - that occur when the plastic is blown into the mould – and how, by overlapping (a coloured PET leaf over a white PP leaf for example), transparent colour becomes translucent colour. 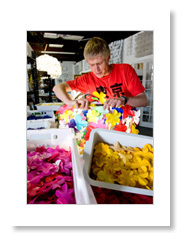 Let me explain the process involved in making a finished flower from a bottle. Try it at home – all you need is scissors! Lots of bottles are found, sorted and collected. They are washed very thoroughly (with bio-degradable detergent) and dried. The handles and bases are carefully removed, and each bottle is splayed open into a semi-flat ‘sheet’. As many flowers as possible are cut from each bottle (we cut them using a die, but because they aren’t perfectly flat sheets, this is done by hand with a hammer – not in a mechanised press). Now each flower has to be formed from a ‘flattish’ shape into a more 3-dimenional form - each petal is folded in half, and individual lines are creased into each (also by hand). This forms the flower, and makes it more translucent where the lines are… adding to the detail and finish of the finished piece. (So if a flower has 6 petals, and there are 9 lines on each one, someone has creased 54 lines! For ONE flower). Finally, One flower is done! The excess plastic off cuts are returned to the recyclers. So it’s a very time intensive process, and for the simplest light we produce, I need 240 flowers. You can perhaps understand now the kind of alchemy at play when precious time is spent making a handcrafted object. There are literally hours invested in every single part of every thing we make, and this invested time and energy is what makes the product beautiful, and inherently valuable. My need for plastic has now become enormous. Initially I only used white bottles – milk bottles, of which there is a plentiful supply. Once I branched into colour, however, I immediately found that certain colours were coming through much more frequently than others. And some colours were not readily available at all. It was a difficult factor to include in any calculations – price and production volumes not the least. To make a successful fullcolourball, for example, EVERY colour is needed – including light blue and brown… But there were patches when I had no brown at all. Over time, I have attempted different methods of collection (please see ‘my studio’ above), and I’ve come to a great system now: a new company has formed which collects, washes, cuts and creases any shapes I need. They have to sort out the colour problem, and the whole problem of storage and cleaning, which leaves me to work creatively. It also gives me a very solid cost to work with for each unit (before, I found it really difficult to cost all the time and effort I was putting in to the collection/cleaning process). So even though the flowers are expensive, they are at least a known cost. And there are extra people employed (who I don’t have to manage) because of my need for them. Over time (about 3 years!! ), by dealing with so many bottles for so long, I started to see them differently. I started to see parts of them as objects in their own right. Initially I had understood them as purely colour, translucency and size. I was essentially ignoring their most obvious characteristic – their shape. I finally started to see them as forms in 2008, which is a really simple shift, but quite significant. I realised that I had been sending valuable pieces back to the recyclers (the handles and bases specifically). So only then did I start to make products from the previously discarded elements – handle forms and base forms. 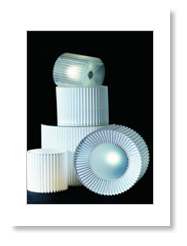 These newfound avenues (still modularly constructed) in turn led to new ways of building objects. I began to use string as a construction element by allowing the individual forms to supply the structural integrity of each finished item, no longer requiring wire pieces at all. Re-use as a design tool (and material) is still extremely under explored, and it holds so much potential – both as a source of raw material and as a beautiful limitation. In mid-2009, I was employed as a designer by ‘the new basket workshop’, an NGO which was formed to help invigorate weaving in Southern Africa. Their purpose is 2-fold – to try and keep alive the existing (but waning) weaving skills in the rural parts of the subcontinent and to help the women they are aiming at to make their wares more palatable and relevant to the contemporary market. 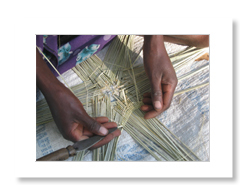 I worked with 2 groups of women weavers – one in Binga, and the other in Bulawayo (my birth-town). It was definitely one of the most rewarding and exciting things I’ve ever done.